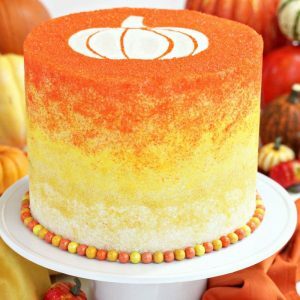 This Stenciled Halloween Sprinkle Cake could not be easier to make! A parchment stencil and ombre sprinkles make this a Halloween masterpiece! Preheat the oven to 350 F. Line four 9-inch cake pans with parchment rounds, and spray the parchment with nonstick cooking spray. Combine the butter and granulated sugar in the large bowl of a stand mixer fitted with a paddle attachment. Beat the butter and sugar together on medium speed for 5-6 minutes, until light and fluffy. Add the eggs one at a time, beating at least 30 seconds between each addition. Turn the mixer to low and add the flour, salt, and baking powder, then the milk and vanilla extract. Continue to beat on low speed until the flour is moistened and everything has roughly come together. At this point the batter might look a little broken or curdled—that’s okay. Scrape down the sides of the bowl and turn the mixer to medium-high speed, and beat the batter for 2-3 minutes more until it’s beautifully smooth. Divide it between the prepared pans—if you have a scale, each pan will get about 20 oz of batter. Bake the cakes at 350 F for 25-30 minutes. They won’t take on much color, so don’t depend on that to gauge doneness. Instead, look for the tops to spring back when you press down lightly, and the sides of the cake to start pulling away from the pan. Let the cakes cool at room temperature for 15 minutes on a wire rack, then run a thin knife around the sides and turn them out of the pan. Let them cool completely before assembling. Combine the whites, powdered sugar, and salt in the bowl of a large stand mixer fitted with a paddle attachment. (A 6 quart mixer is preferred. 5 quarts will work, but you might want to shield the bowl when mixing so the sugar doesn’t fly everywhere.) Mix everything together on low speed, until the sugar is moistened and no dry patches remain. Turn off the mixer, scrape down the sides and bottom of the bowl with a spatula, then turn the mixer to medium speed. Beat on medium for 5 minutes. After 5 minutes, turn the mixer to medium-low and start adding the softened room temperature butter, 1-2 tablespoons at a time. Once all of the butter is incorporated, add the vanilla extract and mix it in. Stop the mixer and scrape down the bottom and sides once more. Turn the speed to medium and beat the buttercream for 10 minutes. At the end, you’ll have a frosting with a wonderfully light and creamy texture. It can be used right away, or stored in the refrigerator for up to two weeks, or the freezer for up to two months. If you have chilled the frosting, let it come to room temperature and then beat it for several minutes to smooth it out and restore its texture before using it. Place each cake round on a 9” cake cardboard, and use a serrated knife to slice them in half, so you have 8 cake rounds. Place one cake round, on a cake cardboard, on a cake turntable. Top it with a generous cup of frosting, and use an offset spatula to smooth the frosting out to the edge of the cake. Add a second cake round on top. Place a generous cup (about 7 oz) of frosting in a separate small bowl, and add a bit of yellow food coloring to it, to make a nice light yellow shade. Use this light yellow on top of the second cake round. Add a third cake round, and again separate out a cup of frosting and tint this one a darker shade of yellow (you can do this in the same small bowl you used before, no need to wash more dishes!) Continue to build your cake in this way, gradually transitioning the frosting colors from yellow to yellow-orange to dark orange each time you add a layer of frosting, until you’ve used all 8 layers of cake. Once the final layer is on, spread a very thin layer of white frosting all around the top and sides of the cake, to seal in any crumbs and blend in any of the yellow/orange frosting colors from the layers inside. Refrigerate the cake for at least an hour, until it’s firm. While you wait for the cake to firm up, prepare your parchment stencil. Print out or draw your chosen design. Make sure that it will fit on top of your cake and that it’s not too complicated—simple shapes work best. Trace it onto your parchment, and cut out the parchment shape. When the cake is firm, use the remaining white frosting to frost the top and sides of the cake, to make a smooth, even layer. Use a metal offset spatula to make the top and sides even. It doesn’t have to be perfect, because you’ll be covering it with sprinkles, but the top especially should be as smooth as you can get it, since some of it will be exposed due to the stencil. Divide your sprinkles into separate bowls. Place the cake on a smaller cake pan, bucket, or anything that elevates it and allows you access to work on the bottom of the cake unencumbered. Place the cake, on the pan, on a baking sheet, to help with clean-up. Start with your white sparkling sugar, and gently press the sprinkles into the fresh buttercream, coming about 1 inch up the sides of the cake. Use the lightest pressure you can so that you don’t leave finger indentations. Switch to a light gold or yellow color (or, if you don’t have a wide variety of colors, mix together white and yellow to make it lighter) and add another inch of sprinkles above the white. You should be almost tossing them onto the cake, the pressure is so light, not firmly pressing them. Continue up the sides of the cake, gradually transitioning from white to yellow to yellow-orange to orange sprinkles. Make sure the top inch of the sides is your orange color. Take your parchment stencil, and lay it in the center of the top of the cake. Once positioned, lightly press it down with your fingertips to make sure the whole surface is touching the buttercream, paying special attention to the edges. Don’t press down hard—you don’t want to leave finger indentations—just gently rub it to get it to adhere. Sprinkle your orange sanding sugar all over the top of the cake, going out to the edges where it will meet the sprinkles on the sides. Refrigerate the cake for at least 1 hour, until the frosting is totally firm. Remove the stencil by using a knife or toothpick to pry up one corner of the parchment, then gently peel it back, showing the white buttercream underneath. As long as the buttercream is firm when you peel it off, the frosting should have a nice and smooth texture. If there are any stray sprinkles on the buttercream, use a soft paintbrush to remove them. Finally, finish by pressing Sixlets or M&Ms around the bottom of the cake. If you have trouble getting them to stick, pipe a thin layer of buttercream around the bottom and press the candies into that. For the best taste and texture, serve this cake at room temperature! The cake recipe is adapted from The Kitchn’s Yellow Butter Cake, and the buttercream is the Easiest Swiss Meringue Buttercream, which is adapted from a recipe by Lauren Kitchens.